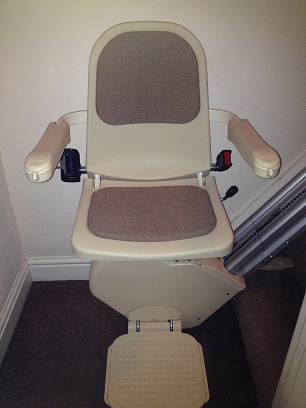 Second hand chair lifts can work just as fine as new ones. They are in fact more popular for some people due to the pricing working out better for them than a new model. Reconditioned ones are those seats or platforms designed with a rail to lift people up a staircase hence the name, and that have been previously installed in another property before your one. Each lift is professionally stripped down then re-assembled to a near new condition. These lifts are often used by those with health and disability concerns and we have also installed them in commercial buildings for lifting loads up to a higher level where stairs are involved, and where the installation of a through floor elevator is too costly. The lift designs come in various types. They have been in production for quite a long time with companies like Stannah, Acorn and Age UK (Minivator) being the top 3 in production in the UK. The chairs are a great addition for service providers dealing with the disabled and the elderly and aged, and a second hand model can help the budget conscious to make life easier when negotiating the stairs. Sometimes the rarer models, such as the perch, sit/stand or a platform lift, can become available in a used or reconditioned form but the majority of used lifts available on the second hand market are straight ones. You can buy a new chair which could go for about 1500 pounds or so depending on installation location and whether any optional extras might be necessary. If this price is too high, then that is when second hand ones have their place. These can come in two types; refurbished curved or secondhand or refurbished straight models. In both cases, proper precautions need to be taken before buying these chairs. One of the most important safety precautions is buying them from a renowned company, like us. We will sell these and custom fit a rail if required as well as offer installation services. These devices come ready to fit your staircase by qualified and experienced engineers. Some of these companies include Stannah, Acorn and Minivator. A refurbished chair from one of these companies could be a really good deal. Why not give us a call to get a free stairs assessment. Second hand lifts usually come at a lower price but not always. You need to consider the cost of it and the cost of modifying it to fit your staircase. The lift needs to be safe and stable for use. The features should also be looked at closely. There are those with remote control features that aid the smooth use of it and also have additional extras like powered swivel seat or hinge and then there are those that have a few mechanical operations. More recent models will most often come with the more modern control features giving you more options. A model with smooth or soft start options are the safest with this technology. These factors have to be considered as well as the person they are intended for. There are those that will allow the user to stand and sit with a few adjustments making them ideal for both case scenarios. The flight of stairs will also determine the type of model required. You can sometimes find one on sites that sell second hand electronic goods. There are many companies selling refurbished ones, though not all is what it may seem. Many on sale will have their specifications in the advertisements and will also come with some stair lifts reviews dependent on the type and the seller of the model. It is either way important to find out more about the lifts through research and reading reviews before buying them. As they come with benefits, running for one simply because you have gotten a good offer could lead to a big loss if it does not serve you well. Consider how long it has been in service. Very old second hand units may develop problems later if not soon after installation. It is wise to always get a new one installed but if pressed for money then buy a second hand one with the much need precautions. Contact us and we can point you in the right direction and get you a very worthwhile quotation to think over. The number is 0800 007 5050.